No Pocky For Kitty can be looked at as much more than a record; it was a turning point. Not only did it put Superchunk on the map (making them the Death Cab For Cutie of the early 90's), it also shifted the focus of the independent music scene from Athens, GA to Chapel Hill, NC. Chapel Hill was home base for Superchunk and ground zero for the label they started, Merge Records. Today Merge is know as one of the elite indie labels (Arcade Fire, Spoon, M. Ward, etc. ), but in the early 90's it was a struggling operation releasing Superchunk 7" singles and small run releases from minor artists like Butterglory and Versus. 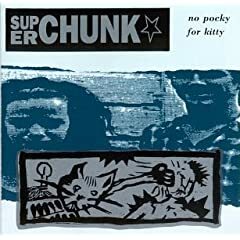 The label was so small in fact that Superchunk released their first 3 full length albums, including No Pocky For Kitty, on Matador Records before making the shift to Merge. This was pre-blog hype, a D.I.Y. aesthetic that would become the template for most indie labels. Similar to what Fugazi did with the Dischord label, exactly what Conor Oberst & company have done with Saddle Creek. On top of all the attention the band received, lead singer Mac McCaughan and bassist Laura Ballance were a couple, and that just seemed to give magazine writers one more thing to focus on. Mac and Laura were indie rock royalty with the likes of Thurston Moore and Kim Gordon (i.e. Ben Gibbard and Zooey Deschanel). Okay, what about the music? No Pocky For Kitty comes at you in three-minute bursts, energized by hyper guitar riffs and fuzzed-out bass. The album opener, "Skip Steps 1 & 3", makes a definite impression. Not as punk as Jawbreaker or Fugazi, not as angular as Pavement or Sebadoh. But like Pavement's Slanted & Enchanted (released less than a year later), you knew from this first track you were in for something special. Overall it's a fairly pop approach with short, hooky songs. Tunes like "Seed Toss" and "Throwing Things" were melodic gems. Producer Steve Albini's raw style added weight to the songs without losing them in distortion and noise. No Pocky is very cohesive - short and compact. "Cast Iron", "Punch Me Harder", "Tie a Rope to the Back of the Bus", all memorable tunes that remain a staple of their live shows. It's a record that is very much of it's time. Again, Sebadoh, Pavement, Jawbreaker - bands doing their own things but very aware of what each other are doing. In fact, Superchunk would release The Freed Seed 7" within a few short months of No Pocky For Kitty, which contained 3 Sebadoh covers. Looking back now, it's impossible for me to believe that this record, or at least Superchunk's recorded output, hasn't influenced guys like Rivers Cuomo and Craig Finn. You can also hear the influence of this time period in records by Modest Mouse, Deerhunter, Cursive and others. I'm not going say that this is one of the 20 best "indie" records of all time, but I would argue that it had a huge effect on what came after it.